This really looks more like love. Forgive me for using another heart ornament image, but really, don't you think? That this is more love-like than the other? The other was about that first bite, that falling, that euphoric-I-can't-eat-there-are-butterflies-in-my-belly feeling. This, however, looks like real, enduring, ongoing love on so many levels. First, all those little lights that look like us inside - oh, I think we are just full of light! - lights that come & go from our heart, keeping us breathing & walking & dreaming & loving. And second, it just looks messy, does it not? And goodness, love is just about as messy as it gets, isn't it? Things get so tangled up, a bulb goes out here & there, a fuse blows. But we keep untangling the cords, keep straightening them out, we replace those burnt-out bulbs - we even keep extra ones around because we know we're going to need them. How optimistic is that? We don't throw out a perfectly wonderful string of lights when it just needs a little care. We keep fuses just in case, and if we're really lucky, we can even fix the cord if there's a problem, replace the plug. And as messy as it is, we're oh-so-willing to do it. I want perfect words for this. I want to give you something as full of truth and as hopeful as this post. Here's all I have just now. And for the record, I thought both images were wonderful....perfect for each post that they represent. oh i love this image... whatever that means. you have perfectly described LOVE. Nuff said. fabulous analogy, yes I think this is much more like love, tangled and messy, and wonderful all at once. Yes, it is indeed all of that! Like life, full of imperfections. And to be able to love with all of the imperfections is a very profound thing. Relyn - I hear your Amen, and raise you! Anonymous - Wow. Thank you! jfrancis - And thank you! Deb - It ain't easy, but so worth it. Thank you. Celeste - You just never know where the truth may be hiding. 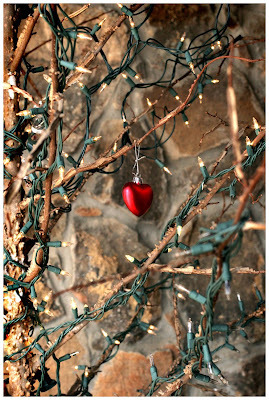 Who'da thought in a string of lights & a heart? However, they are not mine. They were outside a restaurant, and oh! I wanted to steal one quite badly, but a stolen heart seemed like such bad karma, and besides, I want all my hearts freely given. Suvarna - Thank you. It certainly spoke more about love to me. I'm glad to see I'm not the only one! LOL! Paula - All those imperfections keep us interested, I think. Keep us alert. Thank you!